Originally titled ‘Equestrian Portrait’ by an unknown artist this painting had no core information. Jeffrey Dudgeon, a councillor at Belfast City Hall, where the portrait hangs, asked the Art Detectives if they could decipher who the artist was and identify the sitter. 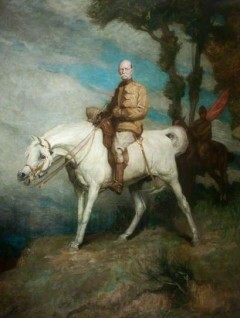 Almost immediately the Group Leader for Military History, Jenny Spencer-Smith identified the portrait as Field Marshal Frederick Sleigh Roberts and after the artist Charles Wellington Furse. Jenny was quick off the mark as there is a version in the National Army Museum of which she used to be the Curator. Peter Harrington gave further information from the illustrated memoir of the artist which detailed how the composition was constructed. Editor’s note: these changes will appear on the Your Paintings website by the end of November 2014. Further information sought regarding the artist and subject of this 'Equestrian Portrait'.